Roll the chops in the flour and brown in a pan on the stove then transfer them to the slow cooker. Peel and dice the onion, crush the garlic and chop the herbs and tomatoes and put this all in the slow cooker, add a good pinch of salt and pepper and cook on low for 5 ½ hours or until the meat is falling off the bone. Put it in another container and the fridge to cool down. When cool remove the fat from the top and discard. Remove the bones and discard. Separate most of the sauce from the meat and put this sauce aside this will be your sauce for the top of the cannelloni it does not matter if there are a few bits of meat still in it. Shred the silver beet and mix this with the cheeses and the meat. To make the pasta, either in the food processor or a bowl mix the egg into the flour and knead well. Roll out on the pasta machine to number 6 and cut into 15 cm long sheets. Cook for about 3 minutes in boiling water and cool. 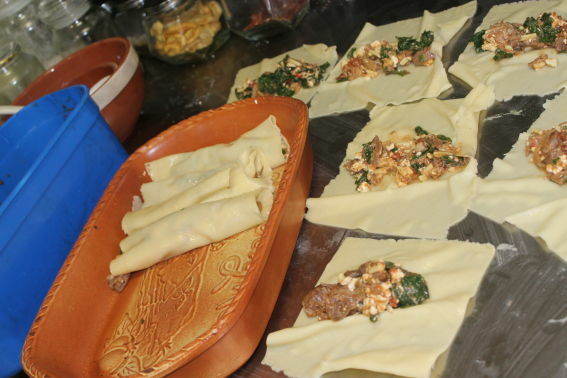 Lay the filling in the middle of each sheet and roll, lay in a baking tray and top with the sauce and parmesan cheese. Bake for about 25 minutes in a moderate (180 C) oven.